Say hello to the SnoKontrol™, Blizzard’s universal DMX-512 lighting controller that's packed with features and built like a tank! With its 384 DMX channels, the SnoKontrol™ can control up to 12 intelligent lights of up to 32 channels and provide control over 30 banks of 8 programmable scenes and 66 programmable chases of 240 scenes. Users can use the SnoKontrol™ to record up to 6 chases with fade time and speed, plus, it is equipped with 16 sliders for direct control of channels. 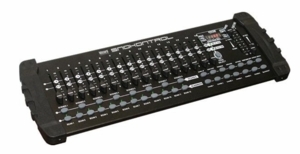 SnoKontrol™ DMX controllers get the job done like the time-tested, quality pieces of equipment they are!